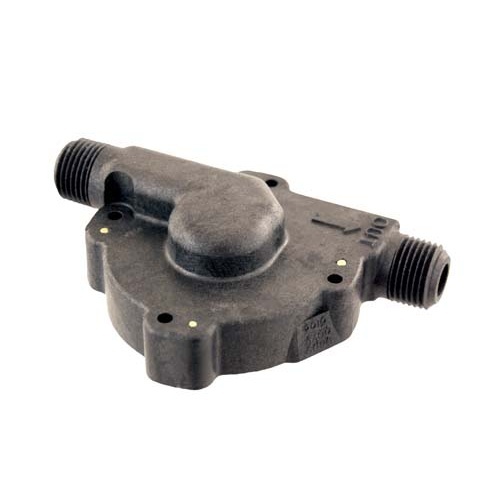 A replacement head that fits either the H315 or H315HF Polysulphone pump. This is only the plastic head, no impeller. How do you get the old shaft out of the pump head? Mine seems to be stubborn to remove. BEST ANSWER: The shaft is press fit into the plastic head, so it should only requiring a bit of twisting and pulling to remove the shaft. The manufacturer recommends pressing the shaft to one side and then the opposite side to loosen, then pull and wiggle the shaft to remove it. A pair of pliers can be used for extra grip, but be sure to wrap the shaft in tape to protect it from scratches. Accidentally dropped my current pump and cracked the head. Quick easy replacement and back to brewing. Fit Perfectly. To all you brewers...while changing it out, there's your time to clean all the parts up.You will need to pull the spindle out of the old head, don't scratch it! push back in by hand or gently in vise. Only issue is that the impeller shaft was really stuck in the old pump head and I was concerned about marring the shaft by pulling on it with pliers. I figured if I scratched up the shaft that the impeller may not seal properly on the shaft. Since the old pump head was damaged, I decided to drill a hole on the exterior of the head. You can actually see where the hole is from the mold they use. I drilled a hole and used a punch to knock out the shaft. Voila. It worked like a charm. Saves a lot of money buying the head replacement vs. the whole pump head assembly. Spend the extra money and buy the stainless. These things cross thread and strip easily. Having the pump head allowed me to quickly replace the part rather that the whole pump. I don't like to waist or to spend unnecessarily and this allowed me to do that. I dropped my pump when attaching to my 3-tier frame. I thought I would need a whole new pump, but was pleasantly surprised to find this item was all I needed to repair and get back to brewing. When I kicked my pump over in the middle of a brew session, I had to run down to More Beer for a replacement. Fortunately they had one and I was back up and running within minutes. I use the metal quick disconnects on my pump. The neighbor kid stepped on them and broke the threaded end off. It took less than 2 minutes to put the new pump head on. 4 screws and a gasket, boom just like new again.